Oita's Hita City is one of Kyushu's most popular travel destinations. In this article, we introduce three types of sightseeing itineraries in Hita - for the leisurely type, for the active type and for the culturally inclined type of travelers. Just one hour away from Fukuoka Airport is Oita prefecture's Hita City. This city is a popular destination even within Japan. It has many highlights including hot springs amidst beautiful nature, and Mamedamachi, an area where remnants of the Edo period can still be found along its streetscapes. When traveling to Hita City, an area blessed with plenty of sightseeing resources, you can choose a travel style based on your personal tastes and preferences. In today's article we'll be presenting three types of Hita itineraries based on different travel styles. This course is aimed at people who would like to get away from the hustle and bustle of everyday life and spend their time in a more relaxed manner. On this course, you can enjoy great scenery and dip into a hot spring without rushing or worrying about the time. This is an active course that's ideal for those individuals who want to fully enjoy Japan's natural environment in an easy manner. 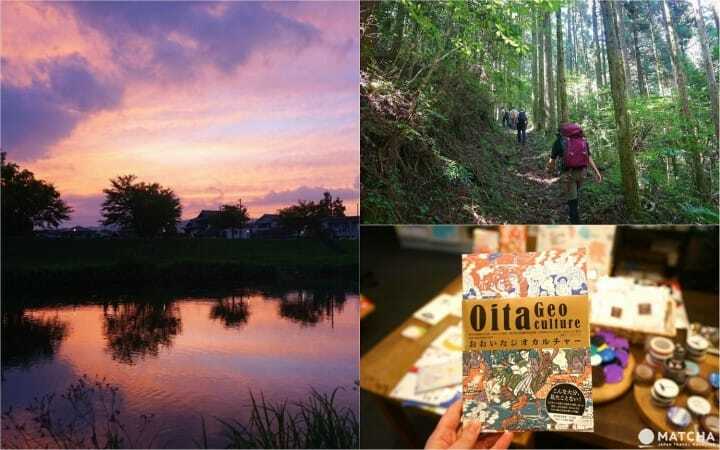 This course is perfectly suited for those visitors who want to interact with the local residents, and learn more about some of Hita City's hidden attractive features, ones not listed in any guidebook. With this article, you'll definitely be able to find the tour that's ideal for you! In Kyushu, including Hita City, the locals' favorite mean of transportation is the car. So if you want to fully enjoy your trip, we recommend renting a car. By doing so you'll be able to make more efficient use of your time, and also get to some secret hideaways that nobody else knows about! To learn more about driving a car in Japan please refer to this article, and for information on access to and from Hita City please click here. Some of you might be thinking that you don't want to drive here in Japan, or that getting an international license is a nuisance. Then for you, the Hita Culture Course is your best choice, because it focuses on a more compact area of the city in which you can get around on foot or by rental bicycle. Beautiful Scenery and Onsen That Will Refresh Body and Spirit! The Hita Leisure Sightseeing Course is a two day (or three day) stay, geared specifically for visitors who want to take their time and enjoy their trip in an unhurried manner. In order to get to a spot with a superb view away from the noisy city center, it'll be a good idea to rent a car and also take a bento lunch. For lunch we highly recommend kikorimeshi (see photo above), an original Hita City bento box made by the folks at Takaraya, a restaurant situated in front of Hita Station. After leaving from in front of Hita Station, we'll make use of the Oita Expressway and head for Takatsuka Atago Jizonson. We'll arrive there in about twenty-three minutes. Takatsuka Atago Jizonson is a facility where visitors can feel Shinbutsushugo (*1), a cultural and religious concept unique to Japan. On the same property there's a torii gate, usually only seen at a shrine, and also a bell, normally only found at a temple. If you visit here, try looking for the specific characteristics of both a shrine and a temple! *1 Shinbutsushugo: a kind of religion in which followers believe in an integrated system that incorporates both Shintoism and Buddhism. The main feature of this shrine are the countless numbers of stone jizo (guardian deity). The long rows of jizo covering one side of the mountain, is an usual sight even here in Japan. The jizo are the representation of bodhisattva, who keeps a watchful eye over travelers and children. So if one departs on a journey from Takatsuka Atago Jizonson where the jizo are enshrined, you are sure to receive blessings referred to as goriyaku. Our next destination is Amagase Onsen. From Takatsuka Atago Jizonson it's a short sixteen minute ride by car. Amagase Onsen's highlights are the local hot spring town and the beautiful scenery along the river, and the exquisite Sakuradaki Falls which boast a vertical drop of some twenty-five meters. At Sakuradaki Falls, your cheeks get dampened by the cool mist of the water. Sakuradaki Falls, with its water crashing down below, is said to resemble a flurry of falling cherry blossoms. This is a magnificent sight that can really renew your body and spirit! Next, how about sitting down on a bench in Sakuradaki Falls Park and eating our bento lunch? A little known secret and one of the best ways to enjoy Amagase Onsen is the hot spring's rotemburo beside the river. While gazing out at the wonderful surrounding scenery, please spend some relaxing time here. For more details on how to enjoy Amagase Onsen's riverside hot spring, please have a look at this article. It'll be a good idea to stay at the Amagase Onsen ryokan, and enjoy the hot spring and their delicious local cuisine. If you're thinking that you'd like to do a little more sightseeing, then let's head over to our next destination, Oyama-machi! From Amagase, it takes about twenty-four minutes by car to get to Okuhita Onsen Umehibiki, Oyama-machi's onsen ryokan. The ryokan's interior design takes a hint from the area's local specialty of ume, or plum, and cuisine that includes this special fruit is served on the premises. Adjoining the ryokan is an umeshu (plum wine) factory where visitors can taste test this local product and also make a purchase as well. Umeshu making classes are also offered, so why not have a hands-on experience making some? Take a look at the splendid scenery of the Hibiki Valley, whose name is also partly included in the ryokan's name, dip into the spacious hot spring pool, and taste some of the specially prepared cuisine. This is a first class onsen ryokan where you can truly experience Japanese culture. The next day after we sleep in a bit we'll have some breakfast, then step into the morning bathing pool, and generally have a relaxing morning. After checking out, let's drive our car alongside the picturesque Oyamagawa River and then go for lunch at Osusowake Yasai-Restaurant Matsubara, located in Nishi Oyama. This restaurant proudly serves wholesome natural food that uses vegetables grown locally by the senior community. For more information on this restaurant please have a look at this article. After lunch, why don't we head back to the center of Hita City and go for a walk through the charming area of Mamedamachi? Mamedamachi is lined with shops offering Hita City crafts, confectioneries, and other products including ontayaki. Here you'll also be able to find the perfect souvenir that brings back memories of your Hita City excursion. For outdoor lovers who've come to Kyushu together with their family or with friends, we recommend the Hita Outdoor Course which will allow you to enjoy Hita city's abundant natural surroundings. For mountain climbing and camping it won't be necessary to bring anything. If you join Snow Peak Okuhita Campfield's Tebura Camp plan, you'll be able to rent everything you need. This plan is also based on a two-day stay and to get to Snow Peak Okuhita Campfield from Hita Station will require a thirty-five minute trip by car. Access A 35 minute car ride from Hita Station. With the campground as our base of operations, let's climb Mt. Gozendake on the first day, and walk through the special Shioji (Japanese deciduous tree) Primeval Forest with its abundant spring water. Afterward let's return to the campground, pitch our tent and then enjoy a barbecue. If you wake up a bit earlier the following day, you can climb to the top of Mt. Shakagatake and get a view of the rising sun. It takes about one hour to get to the summit. For all the information on Okuhita's outdoor activities please take a look at this article. Hita Station → (Purchase mountaineering equipment at Snow Peak Okuhita Campfield) → Mt. Gozendake / Shioji Primeval Forest (starting point for the mountain trail) → Mt. Gozendake summit → Descending the mountain → Camping and Barbecuing at Snow Peak Okuhita Campfield → Watching the sunrise from the top of Mt. Shakadake. Next we introduce the Hita Culture Course. During this course, you won't just be visiting several sightseeing spots. You'll also experience the area's culture along the way, and for those who'd like to get a feel for the daily life of local residents, you'll have an opportunity to meet and interact with some of the unique and special individuals living in Hita City. Even if you just spend a little time in Hita City, you'll undoubtedly notice the warmth and friendliness of the people, and their joy of living. This course also consists of a one night / two day stay. It focuses on the central part of Hita City, so it won't be a problem to get around town on foot or by a bicycle, which you can rent in front of the train station. If your point of departure is from Hita Station, then first of all let's have lunch at Takaraya located in front of the station. We recommend their signature dish, champon. When paying for the meal, let's ask owner Sasaki-san if the kikorimeshi bento lunch is available (for details please click here). Whether the kikorimeshi bento is available or not available, the shop owner will certainly be surprised that you know about this original Hita City lunch. If you reserve an order they'll make it for you to pick up the next day, so don't miss out on this great opportunity! Next up is Liberté movie theatre, Hita City's cultural hub. Even if your reason for coming here isn't to watch a movie, you can still just order a cup of coffee and have a fun time chatting with owner Hara-san. If you ask him about Hita City, he'll tell you everything from the latest cultural events all the way up to the city's history, so you can enjoy listening to some interesting anecdote-filled stories. While visiting here you can also browse through the various crafts, written materials, and art-related items, many that were produced by local artists. Of course, if you see something that appeals to you, be sure to buy it as a memento of your Hita visit. For dinner we've chosen WAKURA, a restaurant sitting on a riverbank, from where you can see a beautiful sunset hanging over the Mikuma River. Here you'll have an opportunity to chat with both the owner, who was born in Hita City, and also with a charming and witty chef. Access From Hita Station it's 6 minutes by car, and about 15 minutes away on foot. After dinner, how about going for a drink at bajio, located in a corner of Mamedamachi along the Kagetsu River? bajio, a cafe-bar that is frequented by travelers from around the world, is a social gathering spot where visitors can easily interact with Hita city locals, and of course with the master of the shop, Setoguchi-san. After spending a restful night at Suikomareso (by reservation only), which is right next to bajio, let's spend the next day exploring Mamedamachi on foot. Access From Hita Station it's 6 minutes by car, and about 20 minutes away on foot. After walking through Mamedamachi, we'll arrive at Hazebo coffee situated at the intersection in front of Hita City Hall, so let's take a well deserved break here. If you chat with the owner who moved here from Tokyo, you'll be able to learn more about Hita City's attractive features from still yet another perspective. After a short break, let's go for a walk through some areas that differ from sightseeing spots, where you can feel Hita City's daily life. We recommend nearby Ohara Hachimangu and various other places. Access 12 minutes on foot from Hita Station. This itinerary is ideal for a two-day stay. You'll be able to hear a collection of interesting stories surrounding Hita City, and it'll give you a sense of joy knowing that you've come into contact with the city's true charm and appeal. Were we able to convince you that Hita City, located in the central part of northern Kyushu, is a place filled with many attractions and highlights? Whether you're the leisurely type or more of an active type, or even if you're a very sociable kind of person, Hita City is a travel destination where all your expectations will be met. So if you choose to come and visit Japan, how about including Oita prefecture's Hita City on your travel itinerary?